Finally an answer as to WHY Ted Cruz (boogerFace) makes my skin crawl. GET ME THE PUKE BUCKET, FAST! Ted Cruz pitches himself as an overcomer, an underdog, an outsider who beats the odds. While the Republican candidate has won four states in this nomination race so far, a neurologist says he still faces a big obstacle with voters: his own face. 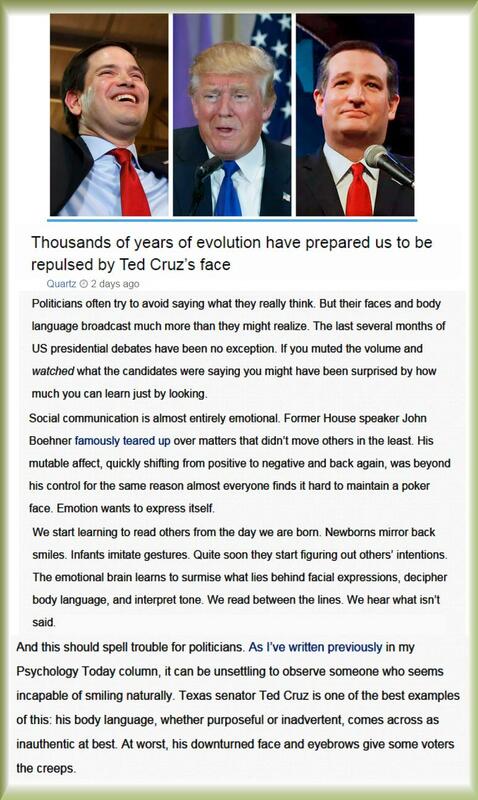 In an interview with Quartz, George Washington University's Richard E. Cytowic said the unusual movements of Cruz's face may make him seem less sincere to the human brain than other candidates. "The normal way a face moves is what's called the Duchenne smile, named after the 19th century French neurologist. So the mouth goes up, the eyes narrow and the eyes crinkle at the outside, forming crows feet," said Cytowic, a professor of neurology. "Cruz doesn't give a Duchenne smile. His mouth goes in a tight line across or else it curves down in an anti-Duchenne smile. So he doesn't come across as sincere at all." Visceral reactions probably drive a lot more of politics than anyone likes to admit; seeming trustworthy isn't the same as being trustworthy, but it sure helps win people over.